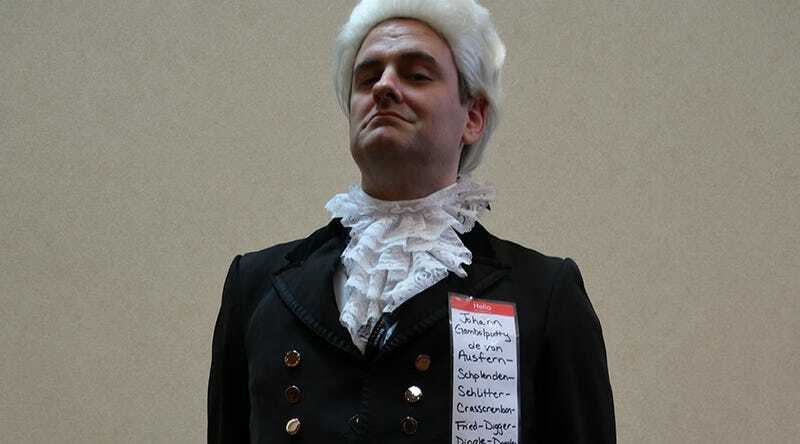 Reader Stephen Hancock was cosplaying as a Monty Python character at Gen Con earlier in the month. I’d tell you just who it was, but the name is too long for our publishing platform to fit in an opening paragraph. So I’ll have to put it here. It’s Johann Gambolputty de von Ausfern Schplenden Schlitter Crasscrenbon Fried Digger Dingle Dangle Dongle Dungle Burstein von Knacker Thrasher Apple Banger Horowitz Ticolensic Grander Knotty Spelltinkle Grandlich Grumblemeyer Spelterwasser Kurstlich Himbleeisen Bahnwagen Gutenabend bitte ein Nurnberger Bratwustle Gernspurten Mitz Weimache Luber Hundsfut Gumberaber Shonedanker Kalbsfleisch Mittler Aucher von Hautkopft of Ulm. I love the idea of cosplaying at a board game trade show. I love the nametag even more.